Walter Weller is a musician steeped in the grand Austro-German tradition. He joined the Vienna Philharmonic, in which his father played violin, aged 17, and became its leader only a handful of years later, in 1961. A couple of Strauss autographs reprinted in this handsome release from Fuga Libera show his links, too, with that composer. Weller is no stranger to the UK, either, having held posts with the RLPO, the RPO and the Royal Scottish National Orchestra (he is their emeritus conductor). 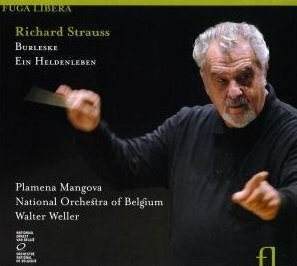 This recording of Strauss's Burleske and Ein Heldenleben, however, catches him at the helm of the National Orchestra of Belgium, whose Music Director he has been since the 2007-08 season. As one would expect, these readings are idiomatic and the Belgian orchestra shows itself to be a pretty handy band. They manage to hang on as Weller steers them through Heldenleben, often at quite a pace, and have some very fine players in their ranks. In all it's a swift, rousing account of Strauss's grand score with several enjoyable moments; the battle scene is particularly rewarding in its drive and carefully controlled balance, if a little untidy at times. This is, however, a very crowded field and there are some reservations which must be voiced. The first of these regards Fuga Libera's engineering which sets the sound of the full orchestra rather low while unrealistically bolstering the solo instruments. It's a shock, then, as the first section comes to its rousing conclusion, to have a flute at the start of the 'The hero's adversaries' sound nearly as loud and full as the preceding tutti. Similarly, Alexei Moshkov's very well played solo turn as the hero's companion is spoilt by the fact that he is unrealistically highlighted in the sonic picture so that we can hear the friction of bow on string. Weller's reading, too, does occasionally sound a little matter-of-fact. Admittedly he is not helped by a recorded tutti sound that is a touch dull, but his swift tempi can be a little unflinching. As a result, the excitement of a hard-pushed battle scene is lost within the context of a performance where everything is a little driven. He does take some more time in the lyrical 'Hero's companion' section but, to my ears, the whole reading has an air of impatience with only a couple of big climaxes registering, with the addition of a nice rallentando, as they should. I also felt that the reflective later sections in the work could have been more lovingly moulded, especially the quotations in the 'The hero's works of peace', where the woodwind players could have brought more characterisation. When all's said and done, though, there are too many alternative performances of this work, with more glamorous orchestras better recorded. Even the slightly rough-and-ready live Philharmonia version released recently on Signum provides more sonic glamour. The liner-note for this disc rather unconvincingly tries to tie together Heldenleben and the Burleske of 1886 without noting the perhaps telling fact that, among all the earlier works Strauss quotes in Heldenleben, this early essay for piano and orchestra does not feature. For a work that's very rarely heard in the concert hall, the Burleske is extremely well represented on disc and those pianists who go to the trouble of mastering its considerable demands tend only to have done so if they really believed in the work. As such, we have excellent recordings from some formidable virtuosi, ranging in the stereo era from Byron Janis to Martha Argerich. The young Bulgarian pianist Plamena Mangova does well to stand up to comparison with her illustrious predecessors, even if she doesn't necessarily compete with them. She has all the notes very much in her reach and is a powerful performer, even if she cannot come close to the kind of elemental power Argerich has at her command when she launches the work (live with Abbado and the BPO from 1992). She is also touching in the lyrical passages and has a good measure of the parodistic intent of the more humorous sections. A perfectly respectable disc, then, but it seems unlikely to find much of a foothold in a crowded market place for both works.